The Mountain Peacock Pheasant, Polyplectron inopinatum - also known as Rothschild's Peacock Pheasant or Mirror Pheasant - is a shy and elusive bird, that inhabits the mountain forests of central Malay Peninsula. 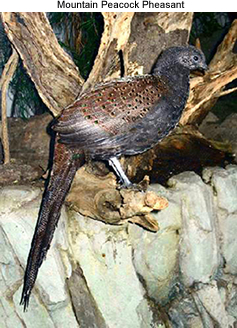 Due to ongoing habitat loss and declining population, the Mountain Peacock Pheasant is evaluated as Vulnerable on the IUCN Red List of Threatened Species, and is listed on Appendix III of CITES. This is a medium-sized pheasant with a length of up to 26 inches (~65cm). The male's plumage is blackish brown with small ocelli and long graduated tail feathers. He has a metallic blue ocelli on upperparts, green ocelli on tail of twenty feathers and two spurs on legs. Both sexes are similar, although there are some small differences. Female has black ocelli on upperparts, unspurred legs and tail of eighteen feathers; and she is smaller and duller than the male. Their natural diet consists mainly of berries, beetles and ants.